You client's perceived value of an Intuiface-based experience will be huge: extraordinary multi-touch capabilities, data-driven, modern design options, high reliability, fast implementation, robust deployment infrastructure, detailed usage analytics…... "Wow, that must cost a lot to develop!" The good news for you is that, with Intuiface, you need only a fraction of the resources - and thus a fraction of the costs - required to build a bespoke app for your client. Oh, and its delivered in a fraction of the time. If you’ve gone the custom coding route in the past (whether outsourced or internal), you know the headaches. Of course, you'll pass the associated costs along to your customer. It leads to less competitive pricing and a less competitive offer. 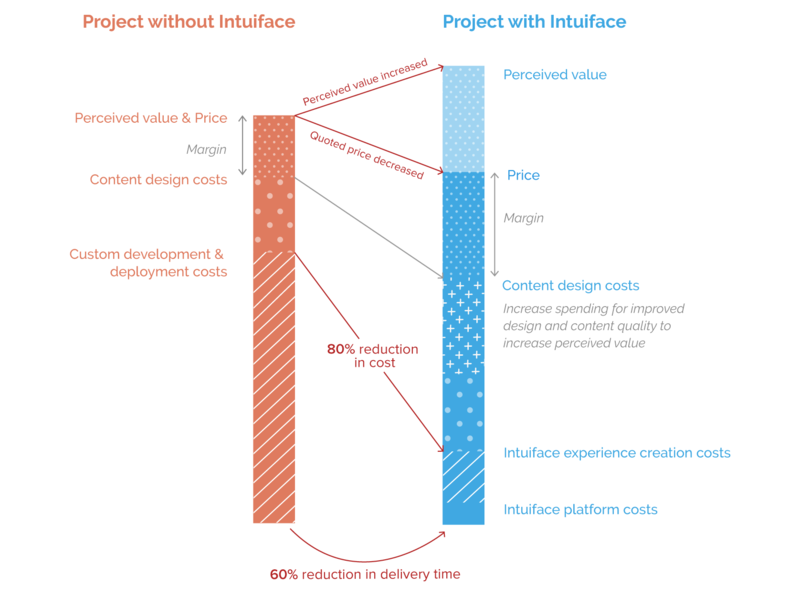 The following picture summarizes the total cost difference between custom and Intuiface-based projects with an eye to perceived value. By "cost" we mean not only the cost of getting to Version 1 of the delivered app but the long-term cost associated with content changes, device OS additions, etc. On the left is a traditional, bespoke project. The business value of a project as perceived by your client and that client's cost for the project correlate directly. In other words, they spend $x and feel they received $x in value. Note the margin over and above your own custom development, deployment, and content design costs. Whether you're an agency dedicated to content creation or an integrator tackling the entire project lifecycle, the benefits of Intuiface are obvious. For the creative effort you are freed to be creative, to focus on providing value rather than balancing a delivery timeline with endlessly writing and testing code. For the broader project, you can price your services more competitively and differentiate yourself with high quality content that stands out in a crowd.